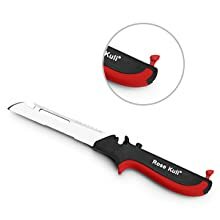 Multifunctionality: 6 in 1 multipurpose clever kitchen utensil knife with a built-in cutting board can chop, slice, dice, peel, crave and open bottles.Save your space,money and time in the kitchen. Stainless Steel Blades: Clever food cutter made from food-grade stainless steel, mirror coated blade, can keeps rust-proof and tarnish-proof over time, different from most kitchen knives. Ergonomic Design: The silicone grips are based on the ergonomic design that will comfort the palm of your hands.Make cooking easy and enjoyable. Easy Cleanup & Safety Storage: Detachable,easy for cleanup.The safety latch prevents from accidental cut also make it easy storage. Convenient for picnics and camping trips. 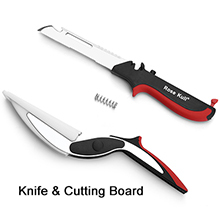 Is the revolutionary 6-in-1 knife and cutting board that chops and slices your favorite foods in seconds! The ergonomic power pressure handle helps to effortlessly cut through food faster. 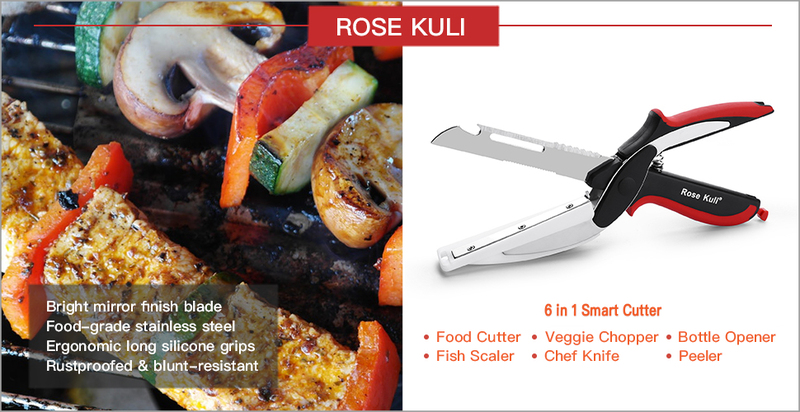 Multi function design can be used as a chopper, dicer, carver, slicer, peeler and bottle opener. Easy to use & clean, save your money, time and kitchen space. Quick and Easy BBQ Scissor Vegetable Chopper - Save Your Prep Time! Enjoy having a BBQ day but tired of making a Barbecue string? Want to enjoy a salad but cann't stand for wasting time prep veggie? Enough for spending time on prepare those vegetable, fruits and meats. Easy and quick to cut the meats, veggie, fruits without using a cutting board. Make a bbq string and salad become a simple thing, save your prep time and enjoy your day! 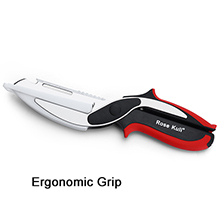 An ergonomic grip which makes for easy, respective cutting and lessens strain on the wrist. Not only a cutter, detachable to be use as a single knife.Easy cleanup and dishwasher safe. Safety lock prevents the veggie chopper from opening and exposing the blade. We have over 10 years of experience in manufacturing and exporting a wide range of outdoor products and travel backpack goods. Starting as a manufacturer of camping Tent, Shovel, Backpacks, Multifunctional Tools, Fishing Rod. Fishing Bait and some outdoor entertainments gadget. We have developed many portable products for outdoor camping and adventuring activities since 2012. Copyright © 2019 . Rose Kuli All rights reserved.